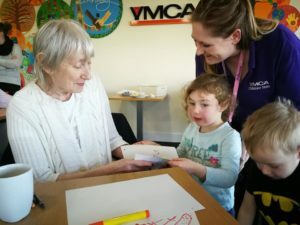 Children from our YMCA Nursery in Andover and elderly residents of a nearby residential home for people for dementia are connecting and enjoying spending quality time together. 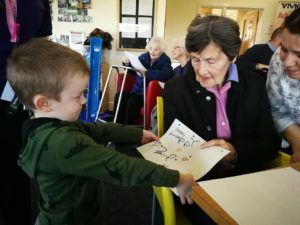 Pre-School children, aged between 3-4 years, welcomed six ladies, along with their carers, from Copper Beeches for a visit last week and were keen to put on a show for them. The residents enjoyed refreshments of tea and cake and spent time with our energetic pre-school children who demonstrated their wonderful musical skills by playing ‘Twinkle Twinkle’ on musical instruments. The morning was finished with making some beautiful craft pictures for the residents to take home with them. 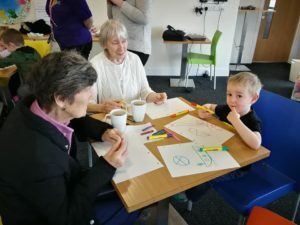 The children benefit from the praise and feedback they receive from the residents and learn about differences between generations and the residents, who might be lonely, enjoy the social interaction with the children who bring them happiness and a day visit to our lovely bright community area.